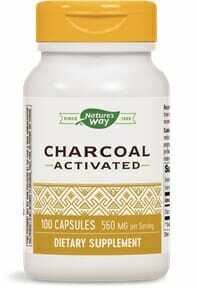 Nature’s Way Activated Charcoal is the perfect accompaniment to any healthy and balanced detoxification regimen. Negative electric charge attracts and binds heavy metals and other toxins for safe removal from the body. This safe and all-natural ingredient is a detox solution for all dietary and lifestyle choices. 560 mg of quality activated charcoal per serving. A safe and natural detox ingredient. Unlike many other leading brands of activated charcoal supplements, this one is free from preservatives and other potentially unhealthy ingredients. Makes a useful addition to any detoxification regimen or bodily cleanse. Commonly used as a natural tooth whitening agent, and many other useful purposes if removed from capsule. In the world of natural detoxification solutions, few ingredients are as widely regarded for safety and efficacy as activated charcoal. While at first it might sound strange that the ingestion of charcoal is not just safe, but beneficial for a healthy body, it is important to note that ‘activated’ charcoal is very different from the stuff you use to light your grill. Finally, due to the body’s inability to absorb activated charcoal, it is safely evacuated, along with numerous heavy metals and other toxins, from the body via the digestive tract. Evidence of this can be found in the stool which often appears much darker in color after the consumption of activated charcoal. This is healthy and a sign that the activated charcoal is working as intended in the body. Nature’s Way® Activated Charcoal Contains no artificial ingredients, preservatives, yeast, milk, lactose, wheat, sugar, soy or corn. Caution: Charcoal`s high absorbency may reduce the effectiveness of certain medications. This product is not intended as a treatment for accidental poisoning. Consult a physician before taking charcoal capsules with other medications. Take 2 capsules after eating. Repeat after two hours if necessary.